Years before I was vegan, I worked at the Canadian franchise of Cinnabon, known here as Cinnzeo. If you’ve ever had one of their cinnamon buns (or at least heard people extolling the buns’ virtues), then you have reason to get really excited about this recipe. Having made hundreds of batches of buns, I know what’s in ’em. And there’s usually four really key ingredients that people don’t know go into making such gooey and amazingly bad for you but oh-so-good buns: a really good, dark brown molasses-heavy sugar and true cinnamon in the buns’ filling, and lemon extract and cream cheese in the icing. Cinnabon and Cinnzeo both use what they call Siam cinnamon, which is just another name for one of the many different kinds of more fragrant, sweet, and rich cinnamons derived from the Cinnamomum species of Asian evergreen trees. The “cinnamon” most of us use every day is derived from the Cassia species of trees and is much cheaper to produce than true cinnamon. In Vancouver, you can get organic true cinnamon and Hunan cinnamon at The Gourmet Warehouse. This is a long recipe, and the process is long as well. 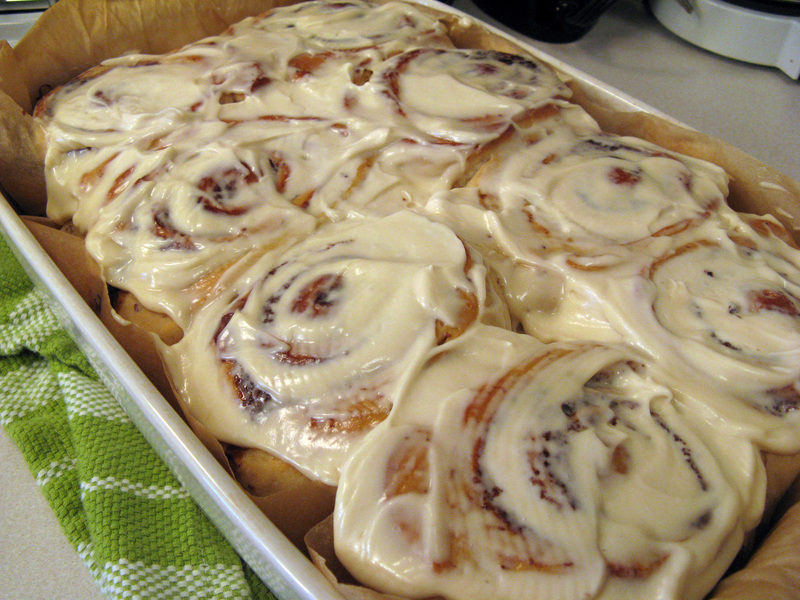 But if you make it, well, the buns will speak for themselves. You could easily give these to anyone not have them know they’re vegan, they’re that good. I dare say you could even fool the most avid Cinnabon/Cinnzeo fan with them. (1) In a small pot (or medium bowl if you use a microwave), warm the milk just enough to still be able to dip your finger in it. You’re going to proof your yeast in this, so you don’t want the milk to be too hot or you’ll kill the yeast. (2) If using a pot, place the warmed milk into a medium bowl. Add the sugar and quickly stir to dissolve it. Add the yeast, then set the bowl aside and let the yeast proof for 10 minutes. You’ll know you have good yeast if the yeast gets foamy on top of the milk. If it doesn’t do this, you need new yeast. (3) While you wait for the yeast to proof, measure out your flour in a large bowl and set aside. (4) With a hand-mixer or stick blender, whip together the ground flax seeds and water. You want a frothy, thick mixture, which requires a few minutes of whipping to get the gelatinous texture of the flax to come out and thicken up the “eggs”. (5) Once your yeast is proofed, add the melted Earth Balance, vanilla extract, and flax eggs to the milk mixture and stir gently to combine. (6) Add the wet mixture to the dry mixture, and mix the dough until most of it has come together. Turn out the dough on a lightly floured surface and knead it for at least 5 minutes, perhaps even 10 minutes depending on how fast you knead and what your dough is like. You want a soft, elastic texture, which you’ll get only after a stage in the kneading where it feels like the dough is getting really firm. If you keep kneading, you’ll get to the stage where your dough ball is smooth and soft but elastic. (7) Place the dough back in your large bowl, and cover with a damp tea towel that’s been run under hot water and wrung out. Place your bowl in a warm place – either in a sunny window or in the oven on the lowest heat possible and the door open several inches. Let rise for at least 30 minutes, or until the dough ball has doubled in size. (1) While you’re waiting for your dough to rise, combine the brown sugar and cinnamon in a bowl and mix well to evenly distribute the cinnamon. Set aside until ready to use. (1) Once your dough has risen the first time, turn it out of the bowl onto a lightly floured surface and punch the dough down into a disc. You’re going to roll out this dough into a large rectangle, so you’re going to need to use a large surface to do this. (2) To shape your dough disc into a triangle, gently grasp an edge of your disc with the tips of your fingers and, with a gentle waving motion of your hand, wave the dough up and down a little to coax it out to stretch out. Do this with three more edges until you have a rough rectangle. Using a rolling-pin, start from the center of the rectangle and roll out to the edge of the dough in one motion to one side of the rectangle. Repeat the same rolling motion until you’ve rolled out a rectangle about 16×20 inches and 1/4 inch thick (the thickness of the dough is more important than the exact size of the rectangle). You may need to wave out the corners of the dough while you’re rolling to help shape the dough into a rectangle. The short edge of the dough should be the length of the rectangle, and the long edge of the dough should be the width of the rectangle. (3) Once your dough is rolled out, using a mixing spatula, spread the Earth Balance evenly over the dough, leaving a 3″ naked margin at one end of the rectangle (the width-wise edge). This naked edge is important because it will stick to the outside of the dough once you’ve rolled it up and seal in your filling. (4) Heap the filling mixture in the middle of the rectangle and, with your hands, spread it evenly across the “buttered” dough, avoiding the naked edge. (5) Now for the tricky part – rolling up your buns. You’ll need to be patient with this, because rushing will give you buns with a really uneven thickness. At the top edge of the rectangle, use both hands to grasp the edge and, with a slight lifting up motion, turn over the edge over itself and tuck it under itself to create your first roll. Make sure the roll is equal in thickness by adjusting the position of the dough. Slowly keep rolling the dough over on itself by working down the roll in sections from left to right. Keep doing this until you’ve rolled up the entire rectangle and the dough is sealed at the seam. The whole roll should be about 3″ in diameter. (6) At this point you’ll have a long log of rolled dough. To ensure it’s relatively even in thickness throughout, gently grasp the dough with both hands and adjust the length by slightly lifting it off the rolling surface. Remember to tap the ends of the roll with the palms of your hand to tuck in any bits of the dough the have spiraled out while rolling. (7) Using a sharp knife (and it must be sharp), cut the dough down the middle of the roll. Don’t press down on the dough; instead, gently and carefully move the knife back and forth through dough until it cuts the surface and easily slices through the roll. You’ll have two equal halves now. Cut each of the halves in equal halves until you have four little logs of dough. Then cut each of the little logs into equal halves so you end up with 8 roughly equal rolls. (8) Line your baking pan/dish (9″ wide, 3″ deep, and 12″ long) with the parchment paper in such a way that the long ends of the paper are hanging out over the edge of the pan. You’ll want this so that the buns are easy to lift out of the pan once cooked and fully cooled (and it helps keep the pan a little cleaner and easier to wash). Make sure you have enough paper hanging over the edges to comfortable grasp in the palms of your hands. (9) Turn each of the rolls on their ends so that they’re facing up. Gently transfer them to the pan – you should have two rows in your pan, with pairs of buns side-by-side. You want the rolls to be touching each other, not the sides of the pan, and the dough seams turned in so the rolls don’t unravel during rising or cooking. (10) Cover the pan with the damp tea towel again, re-rinsed in hot water and wrung out. Let the buns rise in a warm spot again for 30 minutes, or until they have doubled in size. (11) While you’re waiting, preheat your oven to 400F. (12) When the buns are done rising, place the pan in the oven for 10-15 minutes, or until a light golden brown on top. (13) When the buns are ready to come out of the oven, you’ll notice the tops have spiraled out a bit – just gently tap the tops of the buns down flat with the flat edge of your flat spatula/butter knife/cheese spreader. (14) Immediately top the buns with the icing from the icing recipe below (this is so the icing has a chance to melt down between the layers of bun and over the tops). (15) You can slice the buns apart before or after you put the icing on – it really doesn’t matter. (1) Combine all of the ingredients in a medium bowl and whip with a handmixer (not a stick blender) on high for at least 3 minutes, and as long as 5 minutes. You want to get a light, fluffy texture, and you’ll need to get a lot of air into your icing to achieve this. (2) Spread as little or as much as you like over the top of the warm buns. Store any extras in a container in the fridge for up to one week. These look so good! I have never had a cinnabon, but I heard all the praise about them. You’ve just made my husband veeeerrry happy–he loves cinnamon buns and we’ve had trouble finding a good recipe. Can’t wait to try these! Yay! Let me know how they turn out for you. I’m really excited about these – my mum and mister remember well what these buns taste like (they’re both vegan too). They swore these buns are exactly like their non-vegan counterparts. I LOVE cinnamon buns but have never tried them this way. I will definitely give this recipe a try. I myself am not vegan, but many of my friends are. Going to forward this fabulous recipe onto them. Looks delicious. I’m a little confused about step 3: how much Earth Balance should we spread on the dough, before spreading the filling mixture in step 4? The filling mixture contains the entire 3/4 cup of Earth Balance mentioned in the filling ingredient list, no? I’m looking forward to making these. Thanks for pointing out the error, Rebecca. I meant for just the brown sugar and cinnamon to be mixed together and not with the margarine. All of thw margarine should be spread on the dough and then the brown sugar-cinnamon mixture spread on top of the margarine. I’ve updated the recipe to explain this. Although they may sound yummy and delicious, do not be fooled into thinking that because these things are vegan that they are healthier for you – they’re not. icing and brown sugar (white sugar and molasses) is pure poison, so is white flour (unbleached is still white), and margarine is extremely unhealthy for you. It was invented to fatten up turkeys but it kept killing them off, so they decided to offer it up for human consumption instead! Thanks for the comment, I think. Because I don’t believe everything I read, I also check out sources like Google Scholar about things like the history of margarine. When in doubt, look it up. And question who is telling you what and why they’re telling you, too. robboli – no one in their right mind would look at a recipe that uses a tub of earth balance, more than 1/2 a bag of sugar and 4+ cups of flour and think it’s a healthy option. thanks for preaching though. OH. MY. GOSH!!!! Interestingly enough, I am from Vancouver, but we have a family cottage in Muskoka, Ontario, and usually the only time we have to bake is when we are in Ontario!!! Although I searched Gravenhurst high and low for Tofutti (don’t even get me started… I asked for “tofu cream cheese” and they told me “sure we have that”, and then they pointed out tofu, I figured it was like asking for “cream cheese” and them showing me where the Cream is … but not that I’m bitter…) anyway… everything else we had. and O.M.G…!!!!! We live quite close to the original Grounds for Coffee, if you know where that is, on Alma & 10th, and we’re what you might call “cinnamon bun snobs”, we will ONLY buy GforC cinnamon buns… and I used to make some with my grandma in the past… but these were, hands down, the best ever made. The fam was a bit skepitcal (I’ve been vegan for about a year and a half now and I’ve had a lot of “good try Meg” ‘s ….) but I tell you, they were a HIT. My dad, stepmom, and 2 sisters gobbled it down and came back for seconds. These are a family who try to limit their junk food. They LOVED that we knew exactly what was in the recipe, and still it tasted amazing. You’ve certainly had some converts — so thanks for posting and doing this — we’ll be using this recipe again for sure! made these but used a different icing- they were amazing! THANK YOU! Thank you! My sister is vegan, and we come from a cinnamon bun loving family. Now I can bake her some. Woot! Is the low amount of powdered sugar in the frosting a typo? It seems kind of on the greasy side. And not very sweet. Or maybe it’s the margarine – should that be 1/4 cup, not 3/4 cup? These are just unbelievable! Mine came out perfectly, and they were much easier to make than I thought they would be. Thank you! I just made these and they didn’t turn out as I hoped.They didn’t rise much either times, and the end result was a bit chewier and less fluffier than desired. They sort of tasted like they were whole wheat even though I used white flour. I think something went wrong with the yeast- maybe I have to read up on proofing. It did get foamy at the top and I checked that the milk wasn’t too hot or cold. I used the oven method but turned my oven off after it warmed up and shut the door. The temperature was still above room temp, maybe not warm enough though. Any tips for a second try? Just made these, they turned out amazing!!!! Thanks for the fantastic, easy-to-follow recipe! I’ve never made anything with yeast before–for whatever reason it seemed like a daunting ingredient–but this was a fun recipe and these cinnamon rolls were delectable. I made a simpler glace with 1 cup confectioners sugar, 1/2 tsp vanilla, 1/4 almond milk, and oinch of salt and it was perfect. I would like to know if the pictures iof the cinnamon rolls are from your recipe? How can I replace the flex egg? 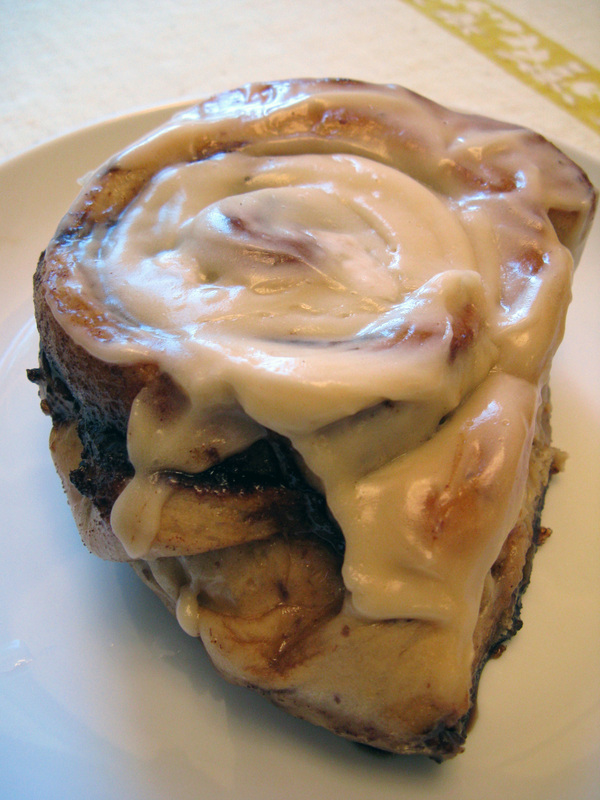 Can I know the original cinnamon rolls recipe of cinnabon or cinnzeo? I hace a bakery in Southamerica and I want to make cinnamon rolls inside. I just mixed the cinnamon and the brown sugar. OMG, that good cinnamon made all the difference. Thanks for the tip! Nicki, did you turn off your oven before you put the rolls in? That wouldn’t work very well. The oven should be preheated but it also needs to stay turned on and set to the proper temperature during the whole baking process, until the rolls are done. Apologies if I misunderstood what you asked. Cheers! I tried to make these a couple of weeks ago and the dough was just like rubber. I think the yeast was too old. I made them tonight and they were perfect. I had no problem getting the dough to roll out to the correct size like I have with past recipes. Awesome vegan adaptation.